The new Reelmaster® 7000-D is a multi-use, heavy-duty reel mower designed for productivity and performance in the most extreme conditions. This mower has it all – power, productivity, and superior aftercut appearance. By the way, it’s also an overseeding monster! Highly reliable Kubota® diesel engines provide compact power for heavy mowing without excess weight. Precision machined cutting units maintain levelness and hold adjustments. DPA allows quick bedknife to reel adjustment. 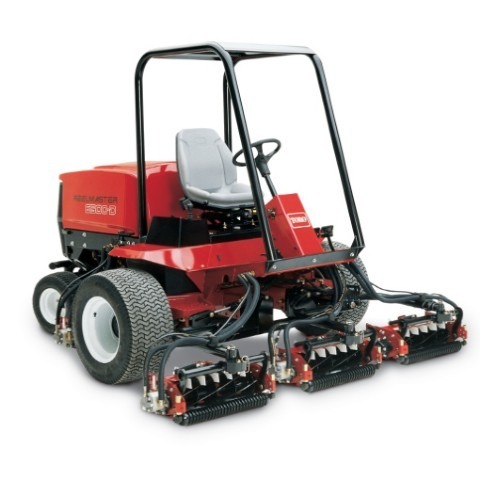 Harder reel and bedknife steel retain a sharp edge up to 3 times longer to minimise the need and frequency of adjustments, backlapping and grinding leading to healthier turf that stays green. By adding two 32` (81 cm) rear cutting units the overlap area can be increased to almost 6` (15 cm) thus eliminating the possibility of uncut grass in tight turns or on hillsides. Variable speed, temperature actuated reversing fan. Blows chaff off intake screen to help reduce overheating. Big time saver which reduces that amount of times an operator has to stop and exit the unit to clean the back hood. Many optional accessories for the tractor and the cutting units are available to provide improvements in performance, productivity and aftercut appearance. All of the indicators and controls to operate the unit are conveniently located on the right armrest. Control console pivots back for right hand entry and exit. Tilt steering, deluxe suspension seat, improved visibility and lower operating noise enhance the operator experience and help to reduce fatigue. Improved access to routine service points and service components, along with a robust machine design, results in less frequent maintenance intervals and less time is required to perform maintenance tasks.